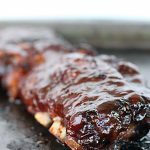 Slow Cooker BBQ Ribs are the the easiest way to make ribs, and they are incredibly tender and flavorful. If you have never made ribs because they seem too complicated or time consuming, this is the perfect recipe. 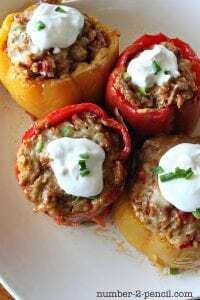 Just like my Slow Cooker Chicken and Mexican Style Stuffed Bell Peppers, you cannot mess these up! 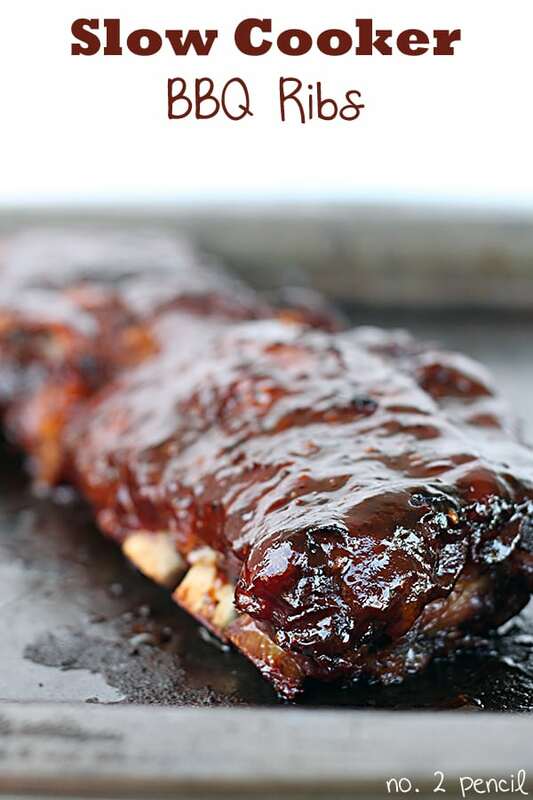 Start with a rack of baby back ribs. Season with salt and pepper, or all-purpose steak season and brown sugar. Rub seasoning into both sides of rack. 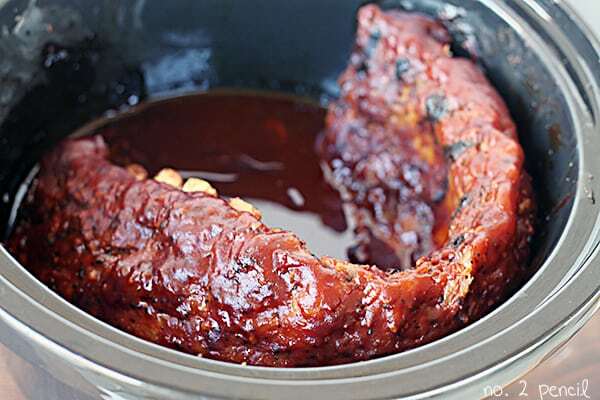 Place entire rack of ribs in slow cooker, meaty side facing the outer wall of the slow cooker. Pour BBQ sauce over ribs and cook on low 6-8 hours. Mine were tender after 7 hours. Once ribs are done, remove from slow cooker and serve. Optional: Broil ribs on high for about 5 minutes in oven to further caramelize BBQ sauce. This recipes easily doubles! Just curve additional rack of ribs on the opposite wall of the slow cooker. Season ribs and place in slow cooker with meaty part facing wall of slow cooker. Pour BBQ sauce over ribs and cook on low for 6-8 hours. Serve warm with additional BBQ sauce. Optional step: Broil ribs, in oven, on high for about 5 minutes after removing from slow cooker. 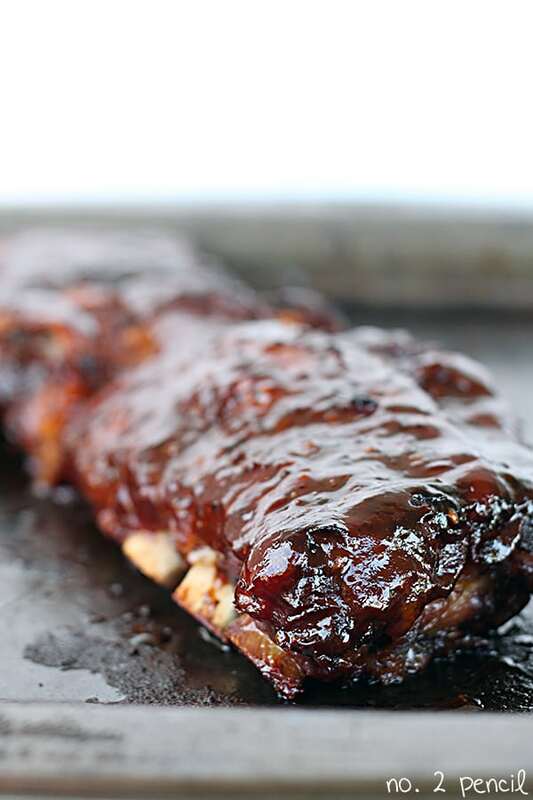 Recipe notes: Some bottled BBQ sauces can be very high in sodium, so take that into account when seasoning the ribs and adjust salt accordingly. This recipe is easily doubled to two racks. mmmm these look so good! 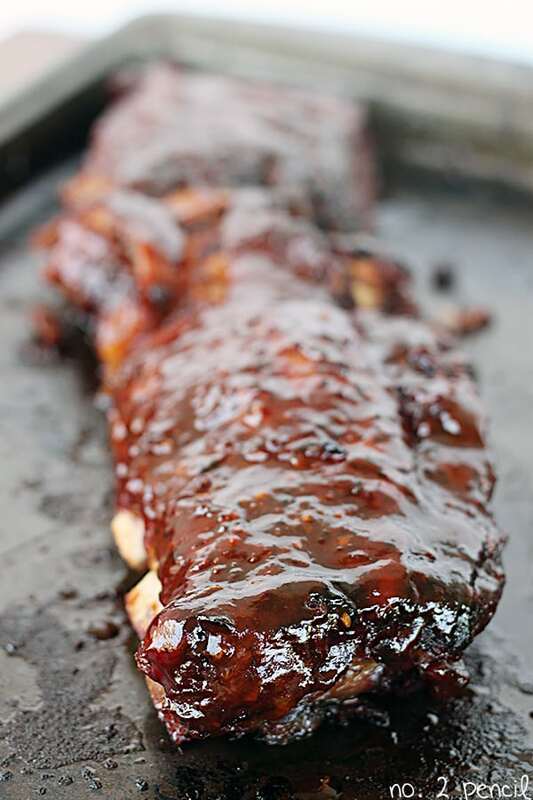 I hardly ever make ribs… must try this recipe! My mouth is watering. Pinned this. Thanks for great pictures so I know how to do this. OMG. This looks killer. I had no idea you could do ribs in a slow cooker! YUM! Melissa. You are KILLING me with your pictures!! They are unreal!! 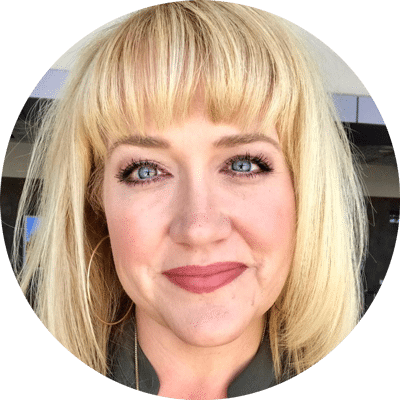 I want to hire you to take mine! 😀 I don’t even like ribs and this makes me want to try them right now! Sharing!! You had me at ribs! Nothing better and this looks amazing! I think I just drooled a little bit! Sharing on my FB page right now! Awesome idea! 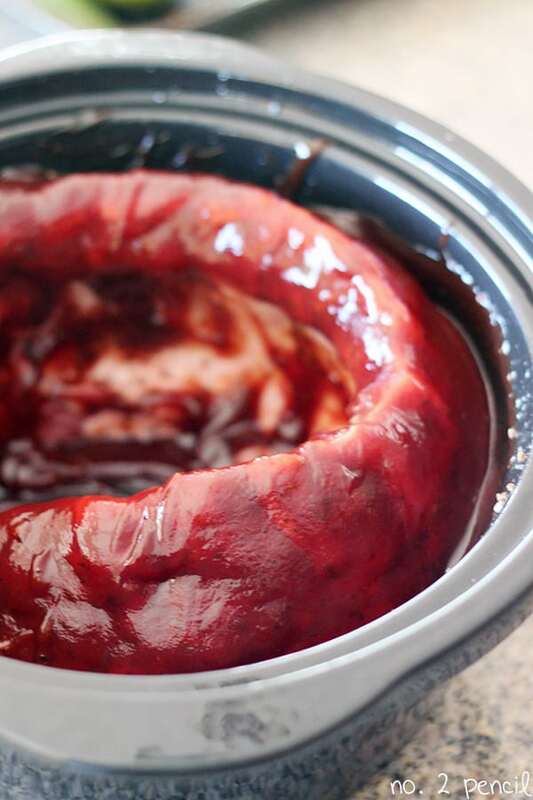 I’ve never made ribs in the crockpot; I’ll have to give this a try! I’ve been wanting to try this. Thanks for sharing how you did it. I love cooking in the crockpot!! Those look great! I will definitely be trying this sometime this summer!!! Oh my goodness I’m so glad you stopped by my Normal Cooking blog because it led me to yours! I love it! I like the layout and the photography, and of course the recipes. Just curious if these would work for country style boneless ribs? Would LOVE to try this but I’m not a babyback rib person LOL! This is an amazing way to do ribs. Thanks so much! I pinned this awhile ago and today I received #500 in repins! Awesome! Thanks so much for pinning! These look so good. I’ve never made ribs in the slow cooker, but I will certainly give these a go. I have 2 boys that play hockey now, and I’m at a rink 6 days a week! I’m tired of eating on the go and I’ve been trying to cook something every night, even if we have to eat dinner at 8. Will try this tonight! My kids love ribs! Great idea! My grandson-in-law uses same method with pork loin. After 9 hours cooking time he pulls it apart and shreds it with 2 forks. Best barbeque sandwiches I ever ate! I want to make these right now, but I’d like to eat them sooner, would putting them in a croc pot on high for 4-6 hours be okay? Good recipe but I’ve never seen a slow cooker create char marks??? Perhaps we put them on the grill for a little visual enhancement? In the last optional step, I suggest putting them under the broiler for 5 minutes to further caramelize the BBQ sauce. That is what I did with the ribs pictured here. I thought the same thing about the char marks. “Once ribs are done, remove from slow cooker and serve.”…. the picture that goes long with this already has char marks….still in the slow cooker, sounds like they have not gone in the oven yet. Says nothing about putting it in the oven then back in the slow cooker. Maybe it was just done for visual, idk. I fail to see how the oven will create char marks either. The only way I have ever cooked ribs is on the smoker or grill, this is the only real way to get char marks. The comment was not rude, it was asking a valid question which was not answered. Maybe try and understand the question one is asking before making a rude comment back. I will definitely try this recipe but do not expect them to look the same way in the picture without going on the grill. Maybe I will prove myself wrong. Only one way to find out. Just finished preping my ribs and they are slow cooking as we speak.. Can’t wait to bite into one of these tonite. I have my 6 year old Grand Daughter with me tonight and she is a big rib lover so when she gets off the school bus and walks through the door and inhales the smell of those ribs, she’ll know what Gram has cooking for dinner tonite and she will be mighty happy.. We’ll let you know how they come out.. Can’t wait for my house to fill up with the aroma of the ribs.. than I’ll open my windows and tease the neighbors… LOL.. I tried these tonight. Oh my goodness were they delicious! The meat was falling off the bone and very juicy. I wouldn’t skip on the extra sauce and broiling them for a few minutes. It made all the difference. 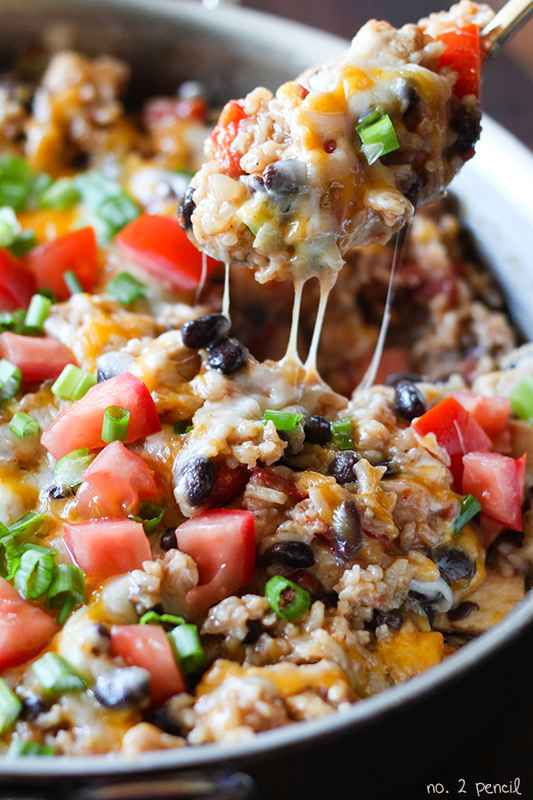 I have a feeling this recipe is going to become a staple in my house. Thanks! Do you remove membrane first or is this not necessary when using the slow cooker? I did not remove the membrane. Thanks for the question! i am a mother of 5 growing girls and they love ribs and today daughter #4 gets to pick dinner and she picked your recipe to try. 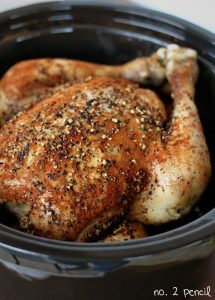 They are in the crockpot right now and they smell delish! Also I’ve never put ribs standing up in the crockpot before, now I will never go back to laying them on top of each other so thank you! Okay, I made these ribs last night per the recipe. Wow, what a hit. Even the master grilled of the family praised them. Thank you for sharing your recipe. 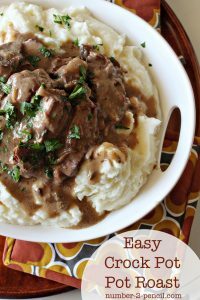 Is any water needed in the slow cooker for this recipe? You don’t need to add water. We have been looking for a good way to make tender (falling off the bone) ribs. This recipe was perfect! So simple too. Thanks so much! Do you use fresh ribs or frozen ones? If frozen, do you need to thaw first? Great recipe, thx for sharing!